Wright was an inventive and talented artist who painted portraits, landscapes, and unusual images of contemporary life. He spent most of his career in his native Derby in England, but a trip to Italy in 1773–75 provided much material for his art. He witnessed an eruption of Mount Vesuvius and sketched the grottoes off the coast of Salerno, near Naples; both subjects became favorites for his later work. A group of melancholy bandits adds a picturesque note to this composition, one of Wright’s most important grotto paintings. With its hazy atmosphere and soft, golden light, the landscape is at once poetic and realistic. See Benedict Nicolson, "Joseph Wright of Derby: Painter of Light" (New Haven and London, 1968), vol. 1, cat. no. 277. 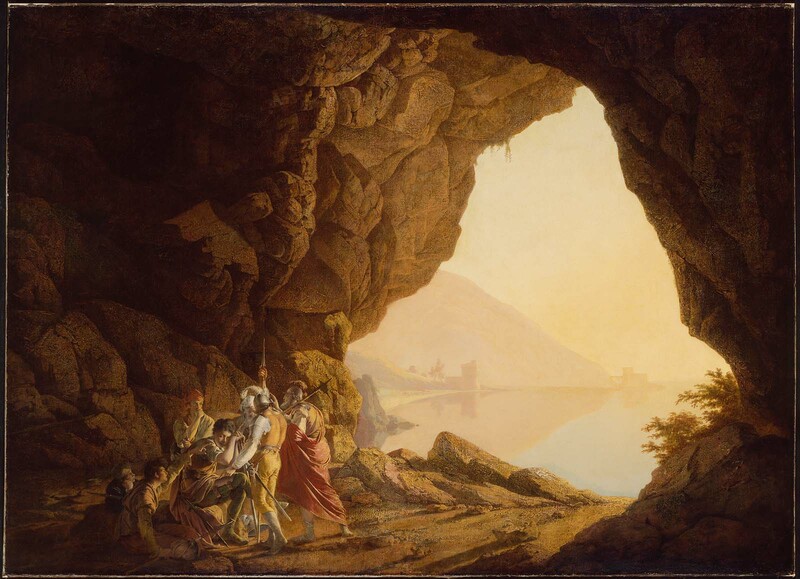 Wright sent Cockshutt a bill on August 29, 1780, for this painting and two others, "A Cavern with the Figure of Julia," and "Virgil's Tomb." The painting was accepted in lieu of payment for a debt owed to Meynell; see Nicolson (as above, n. 1) and Judy Egerton, "Wright of Derby" (exh. cat. Tate Gallery, London, 1990), p. 162, cat. no. 99.